This is a handy midweek supper and takes half an hour to make. Pork loin is quite an expensive cut but this makes it go a long way and makes the most of it. First of all slice the pork loin into slices about a centimeter thick. Put them cut side down, cover with some cling film (saran wrap) or whatever you have to hand and give them a bash with a heavy implement (or the blunt end of the knife). Don’t smash it to bits, it’s quite delicate, just bash it so it goes nice and thin. Voila, medalions. Sprinkle a little salt and freshly ground pepper over each medalion. Heat the butter in a frying pan until it’s foaming hot and fry the medalions on each side for around 45 seconds or however long it takes to cook through and get a bit of colour. Do this in batches if necessary. Set the pork aside and keep warm. I always get frustrated when cookbooks tell me to set something aside to keep warm. Where? How? I haven’t got a hotplate handy. You didn’t tell me to. So I just put it on a plate and cover it with another plate. Works well enough. Now pour the wine into the frying pan and scrape the pan to get up all the bits that have stuck to it. Add the sage and simmer for a while (say, 3 minutes) to take the sharp edge off the alcohol. Add more wine if it is evaporating too quickly. Arrange the medalions prettily on a plate and pour over the sauce. 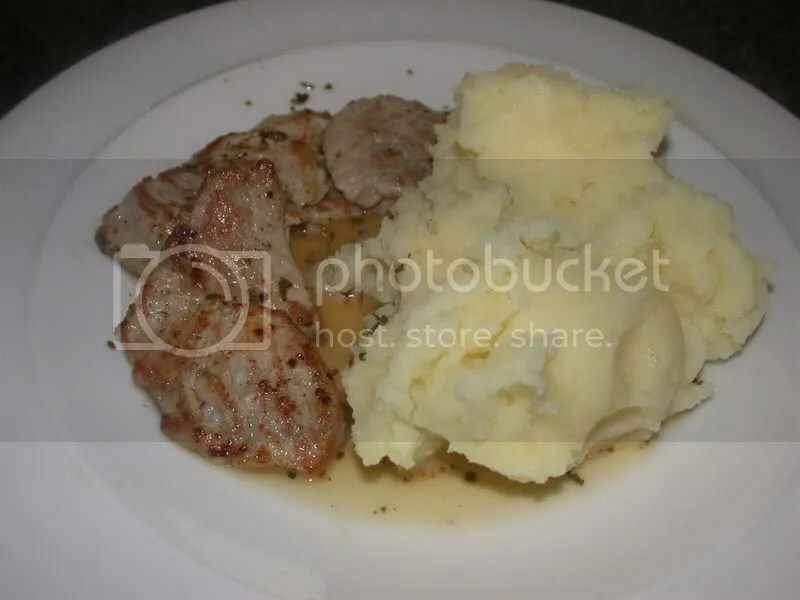 As you can see, I served mine with mashed potato. It was very nice. You should try it. Ooh that looks nice. I think I will have a go at that. That does look delicious. That’s just the sort of thing I like to eat, but with different seasonings. I don’t do much with wine as I’m not much of a drinker, but my fiance is, so I’ll have to try this. Thanks.